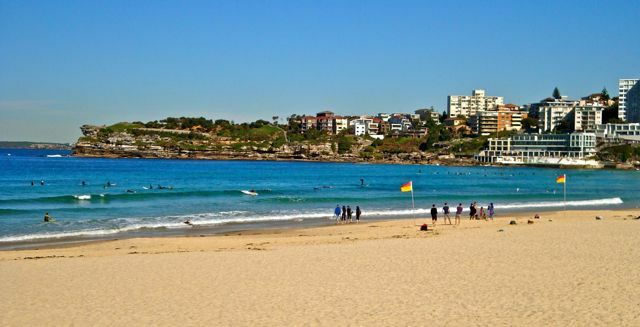 Bondi (Bondeye) Beach is Australia's most well known beach. 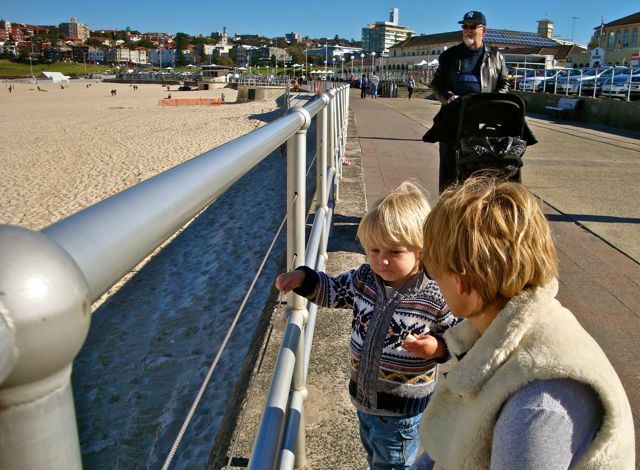 It is one kilometre long and is only 7k /4m from the centre of Sydney. 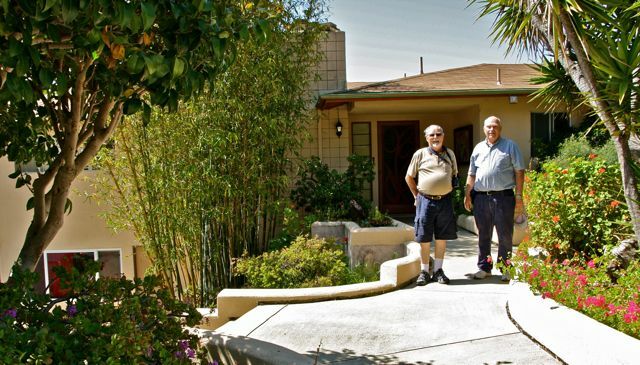 Originally a working class suburb made up of mostly jewish migrants from many different countries, it is now moving towards middle/upper class clientele and land and houses are very expensive. In summer it is crowded with tourists in winter it is very pleasant. Some still swim brrrr. 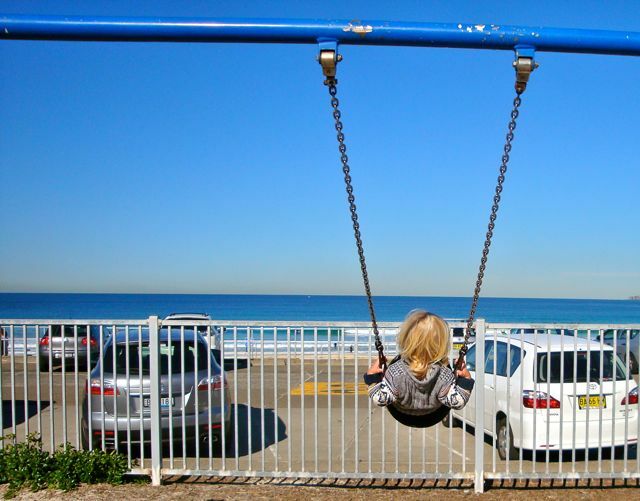 We took Fox for a swing in the children's park which is on the other side of the world from my header photo. A jet setting swinging kid at 2 years. We walked along the esplanade with mummy. Granddaddy was pushing Banjo. 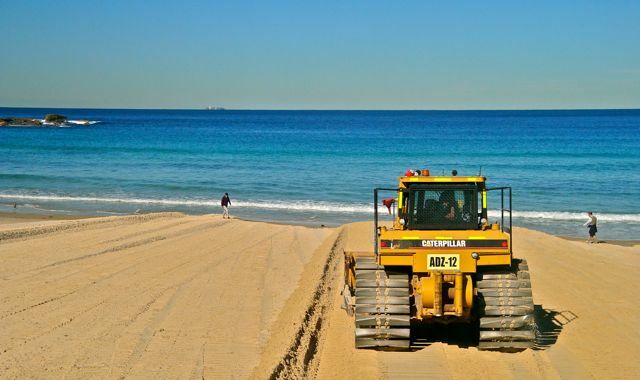 Fox shows mummy the grader on the beach. It was taking the top layer of sand off and exchanging it for the bottom layer. Don't ask me why. While we were in San Francisco we were fascinated with the old cable cars. We rode on them every day and we stopped off at the cable barn and museum. The barn is where all the machinery is that drives the cable system under the streets of the city. 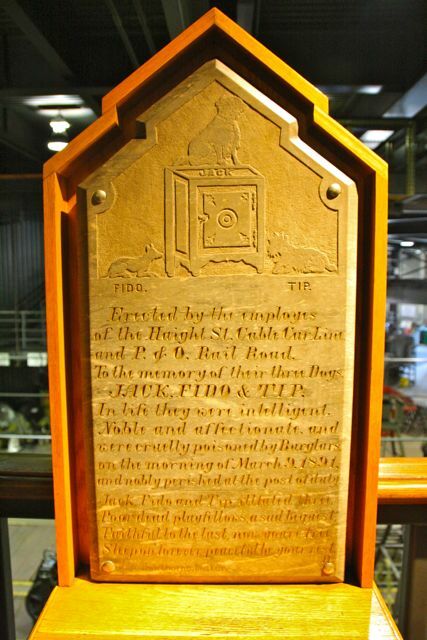 In the museum I saw this plaque which was erected by the employees. perched on top of it. To the memory of their three dogs. and nobly perished at the post of duty. Jack, FIdo and Tip. Ill-fated three. Poor dead playfellows, a sad bequest. Faithful to the last, now you're free. Sleep on forever, peaceful by your rest." On the stormy night of March 9.1891, Jack. Fido and Tip heard three safecrackers chiseling into the brick wall of the cable car barn that held the safe of the Haight Street Cable Car Line. The dogs not only barked, but they attacked the burglars, who threw them poisoned meat. The dogs naturally ate the meat, but meanwhile their barking had attracted the watchman, who emptied his pistol at the burglars, scared them off and saved the safe.The dogs died. This is my contribution to Taphophile Tragics. I've been a bit busy since the last post. Sorry that I haven't had time to visit your blogs. After the last Birthday Bear celebration we were soon on our way to Sydney. We drove down, taking two days. We stopped at Armidale for the night. In the morning frost covered the trees, it was cold and different for us coming from frost free Brisbane. We arrived in Sydney and booked into our accommodation the day before Sonya, Bernie and our two little grandsons arrived from LA. We came down to help them settle into their rented house while Bernie starts work for Channel Seven. The first night we had dinner at Carol and David's apartment. 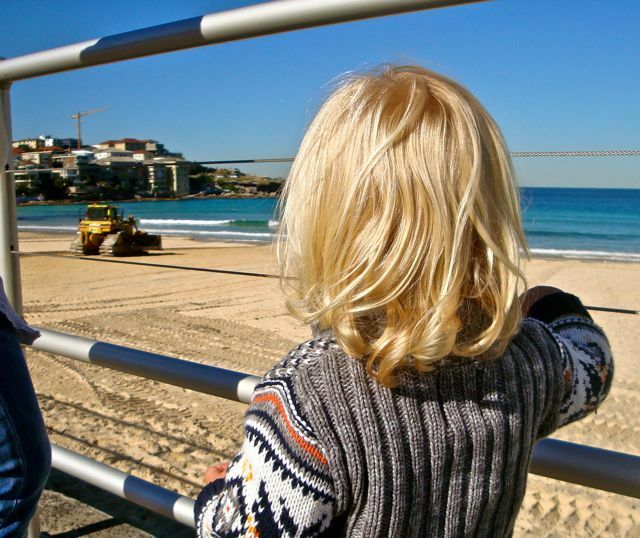 It is great to know that both our daughters will be in Sydney for a few months. The boys are as cute as ever but they are suffering jet lag. 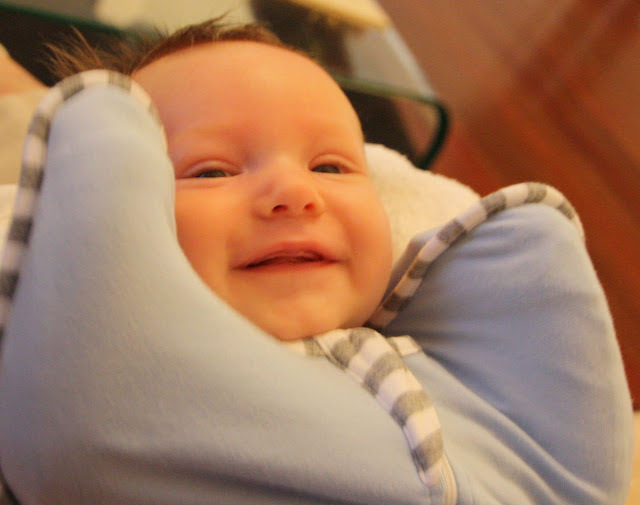 Banjo can give us a smile now. 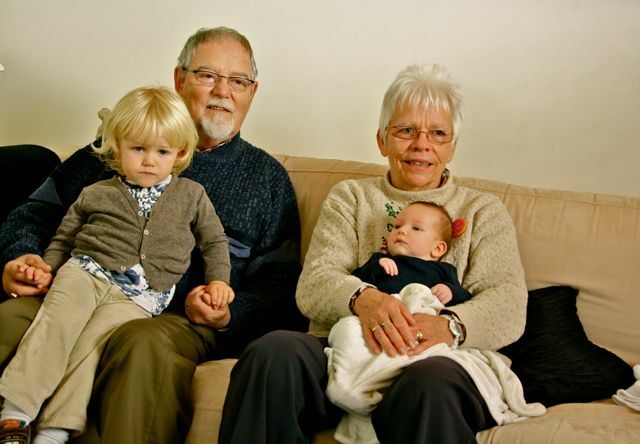 It was my 70th birthday today and it was great that I could celebrate with our two daughters and their husbands as well as the grandchildren and a special friend and her granddaughter, Pepper, who is Fox's best friend. Our son in laws, Bernie and David cooked us a very nice meal of prawns, roast chicken and a big variety of vegetables and salad. 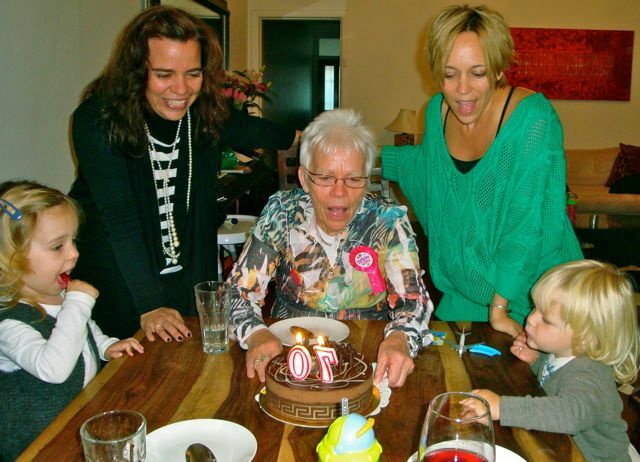 I was so happy to be with my wonderful daughters on this special birthday. I have always said I'm going to climb a mountain when I'm seventy so, for a present, the girls have bought a ticket for the three of us to climb the Sydney Harbour Bridge, which is not quite a mountain but it is an exhilarating climb. Its going to be exciting. Hope I make it! BIRTHDAY BEAR, THE GREENHOUSE EXPERT. Today we celebrated Mary's birthday at Michael's Oriental Restaurant. 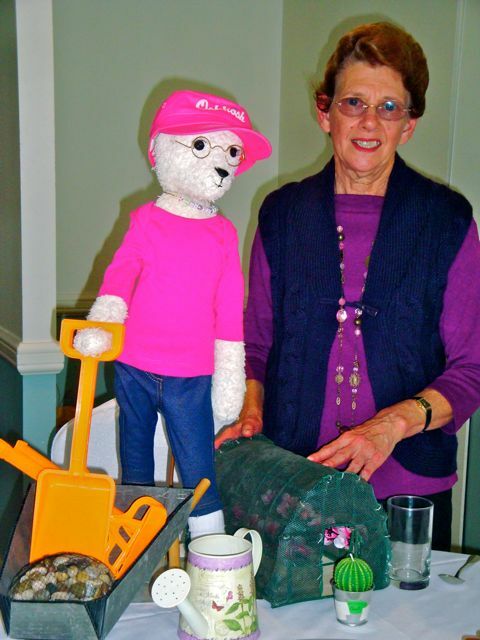 Mary has recently bought herself a green house and she has been working hard in it and around it. Birthday Bear came to share some of her expert knowledge on greenhouse gardening. 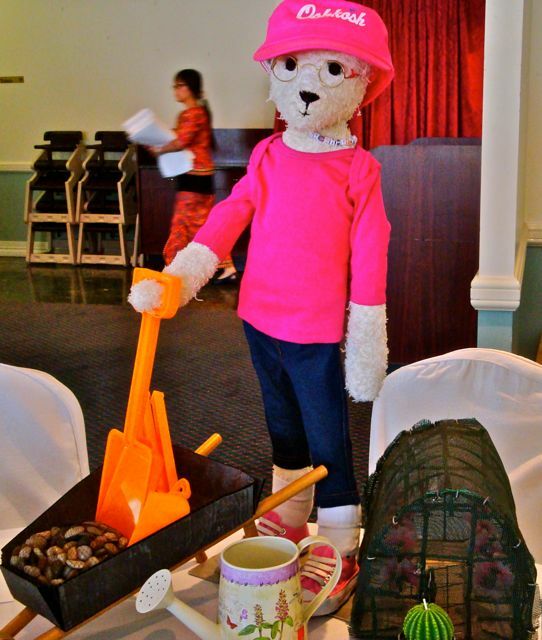 She is dressed in her gardening outfit and brought her wheelbarrow of pebbles, tools and a super little greenhouse, with shelves of flowers and a wee door too, thanks to the clever hands of Ann and George. For those not familiar with our Birthday Bear tradition can read about it here. I love her new pink shoes and fancy watering can. She has a succulent candle too. We ordered a banquet and there were many different, delicious dishes (say that fast 6 times). 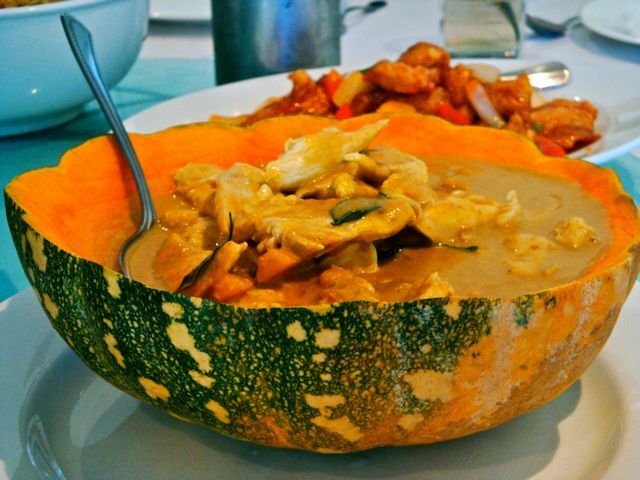 The chicken and pumpkin curry was presented nicely in the shell of the pumpkin. (l to r) Bob, Bill, moi, Birthday Bear, George, Mary, Ann, Helen sans Paul, Chris. We had a great time together especially as Chris and Bob our travelling buddies were near Brisbane so they could join us. Sadly, Paul wasn't able to be with us today as he had a large dose of Chemo therapy on Wednesday and he is toxic and should stay away from people for a while. Poor Paul is fighting Mesothelioma. The sad time has come when we must rethink our two car policy. Ever since our first baby, 40 years ago, we have had two cars. However, now that we are retired we don't really need two cars as we do most things together. We find ourselves saying, "Which car will we take?" So why have two when they cost so much to register, insure, service and run?. 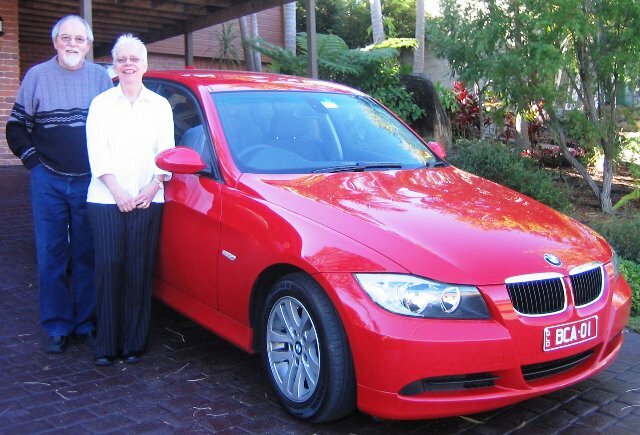 Our beloved BMW was 7 years old and needed over $2000.00 worth of engine seals replaced. 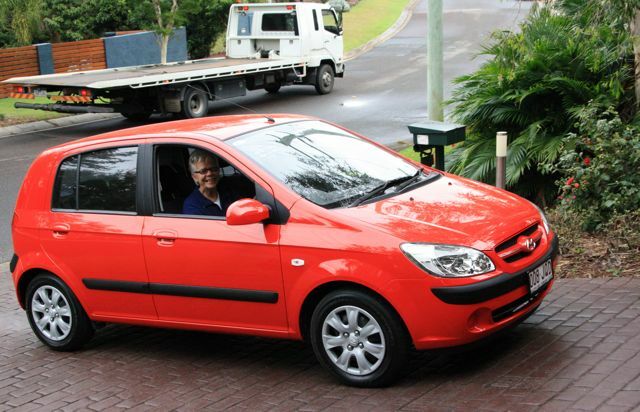 My cute little Getz was 6 years old and needed new tyres and reregistering next month. Last week we bit the bullet and made the decision to trade them in on a new car. We wanted to do a swap without paying anything. We knew another BMW would be out of the question for what we could get for the two old cars so we turned to Hyundai because we had been very happy with the Getz. Surprisingly we got our wish and now we are the proud owners of a new Hyundai Elantra Elite, without paying anything. This is a downgrade for Bill but an upgrade for me. The best thing is we save thousands of dollars on repairs and the cost of running two cars. However we were sad to say goodbye to our 2 cars especially the beautiful BMW. When we went to pick up the new car the sales people were all excited for us and said," You must be very excited picking up your new car." Old spoil sport me said, "Not really, it's sad to give up a BMW." That didn't go down too well. Anyway now we are reading the manual and trying to figure out how everything works. Bill seems happy with his new toy and I think it looks pretty snazzy even if it isn't red. Just in case American readers are not aware, cars cost a lot more here than in US. This model is $8000.00 cheaper in US. 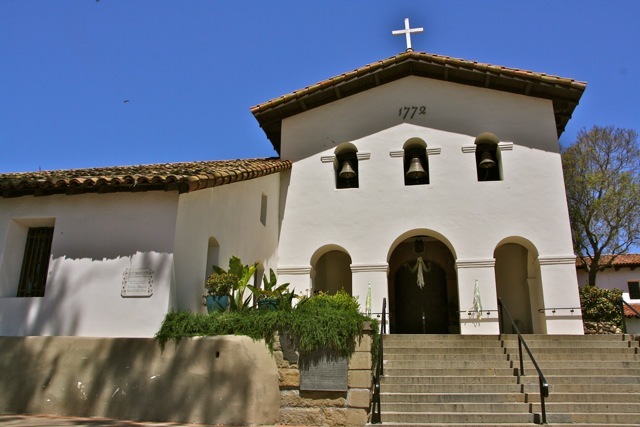 While in San Luis Obispo we visited the mission. 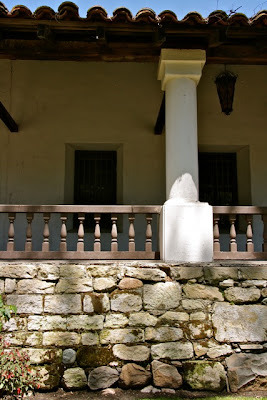 I loved the old Spanish architecture and I became interested in the history of the California missions. 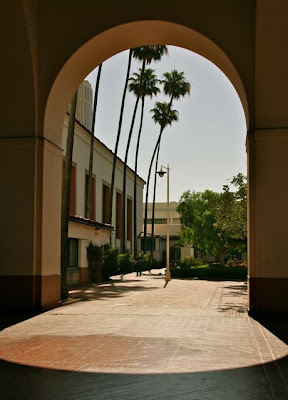 Between 1796 and 1823 the Spanish catholics of the Franciscan Order established 21 missions along the Californian coast from San Diego in the south to Sonoma in the north. Each mission was a days trip apart, on horseback. The idea was to convert the native indians to Christianity. 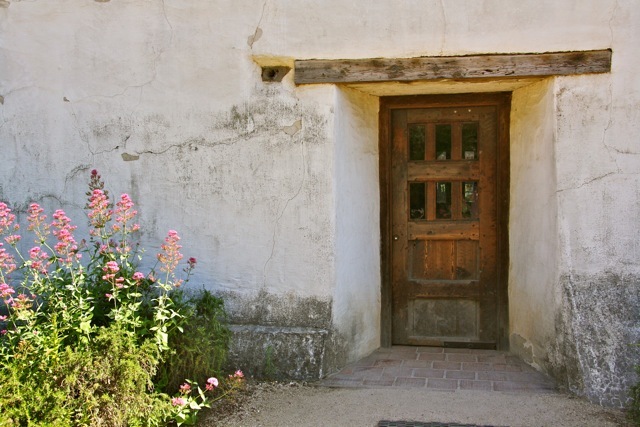 When Mexico gained independence they shut down the missions and sold them privately. Later the US government gave the missions back to the catholic church. 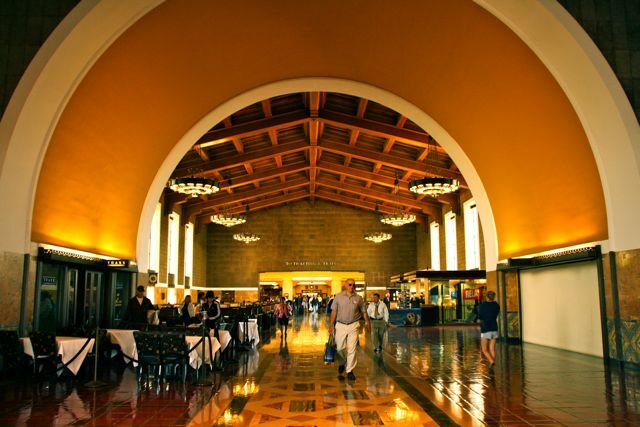 The missions have been restored and they are among the states oldest buildings and are the most visited historic structures. 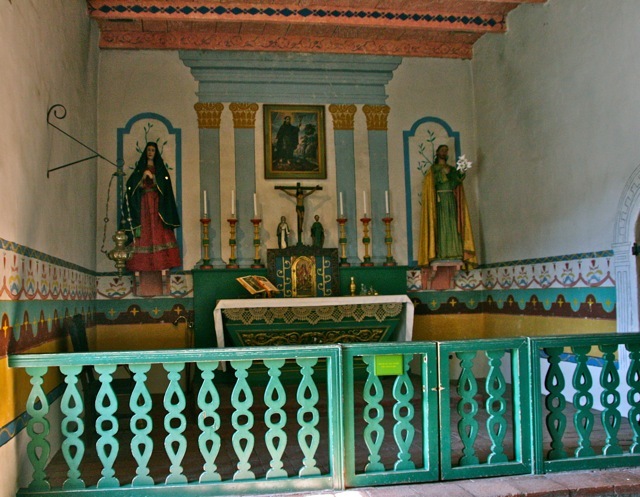 San Luis Obispo De Tolosa was completed in 1794. It occupies a whole block in the downtown area. After it was closed down it was owned by the Mexican government. Now it is a parish church. 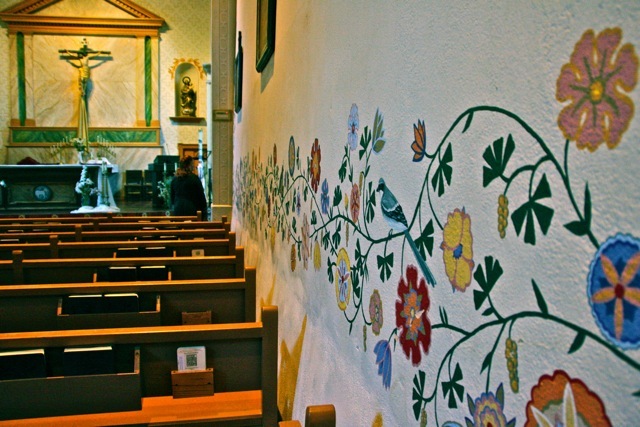 A week later we were in Sonoma near San Francisco and I visited the mission there. 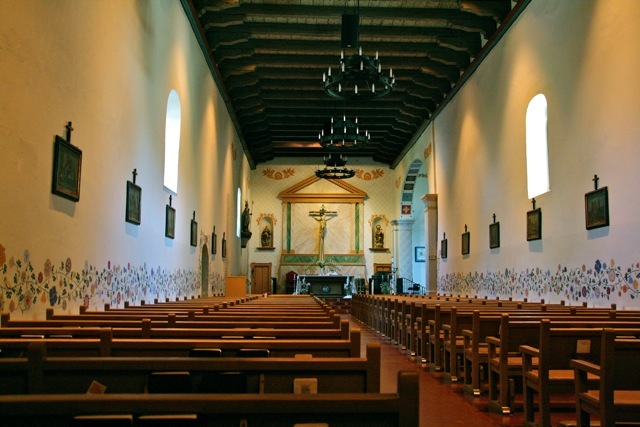 San Francisco Solano de Sonoma is the most northern mission. It was the only mission established after Mexico gained independence. 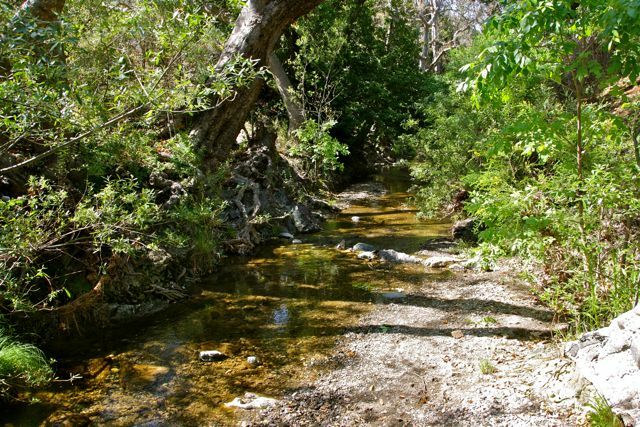 It was used to protect Mexican land against Russian influence. It was badly damaged in the earthquake. Today it has been restored and it is part of Sonoma State Historic Park. 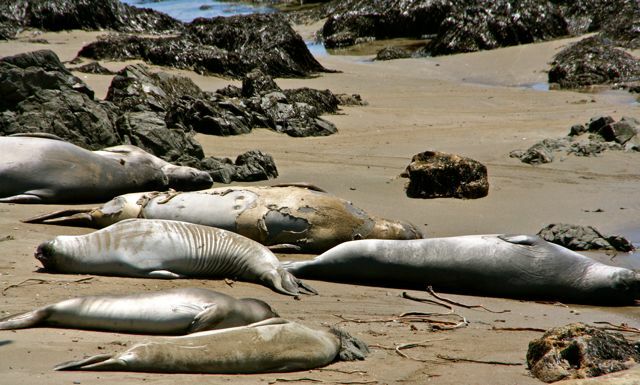 After visiting the elephant seals my cousins took us to other interesting places near San Luis Obispo. 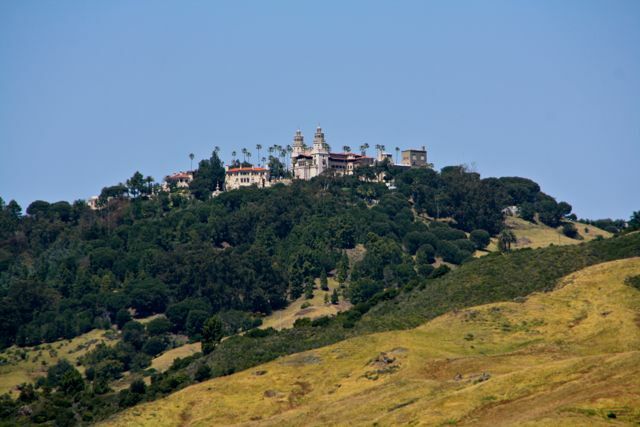 We called into the visitor centre for "Hearst Castle" but we didn't go on a tour of the castle as we had done that years ago and we had other places to go which we hadn't seen before. We called into an exclusive village called Cambria but there was one not so exclusive house named "Nitwit Ridge". 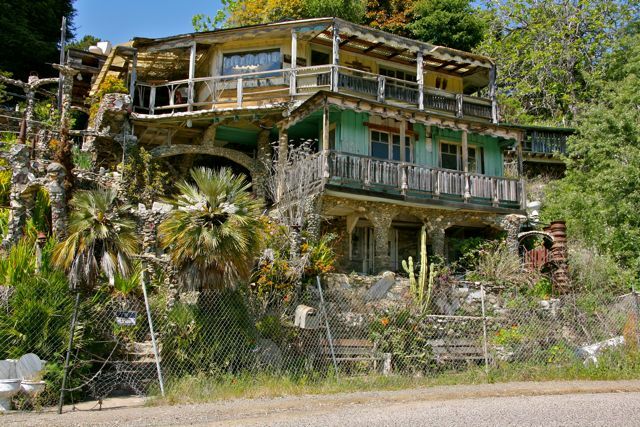 It was made out of recycled rubbish it may have been something special in its heyday but it is condemned now. 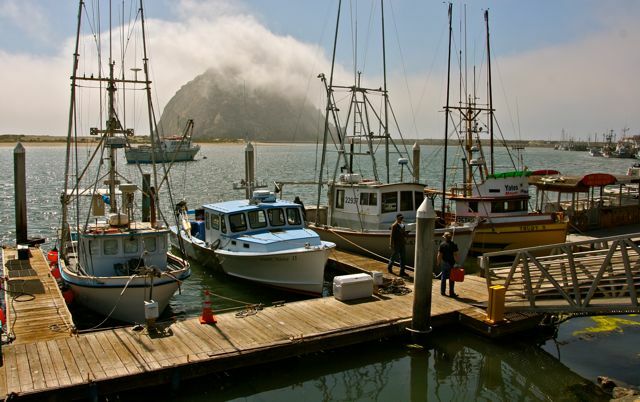 Then we drove on to a pretty beach town at Morro Bay. Morro Rock out in the bay is one of nine extinct volcanos in the area. It is a bird sanctuary for nesting Peregrine Falcons. 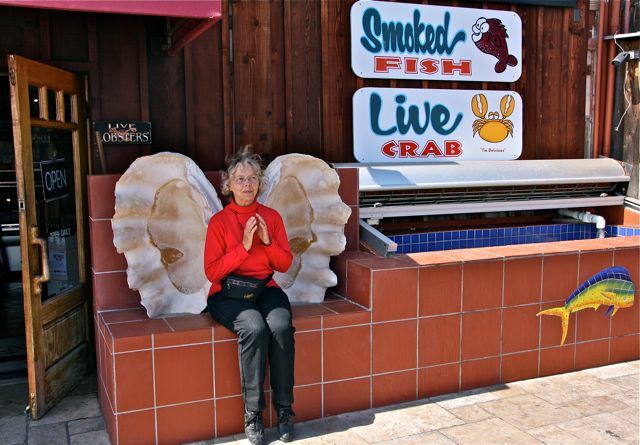 Near the wharf there was a fish shop with a giant clam shell outside, where one can sit an pretend to be an angel. My cousin's wife Lois is an angel. 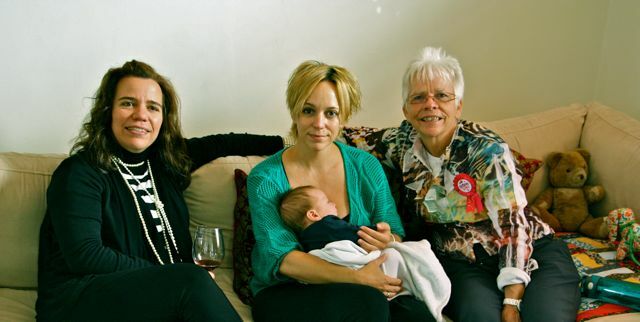 She is committed to her religion, a good artist, a super host and a loving, caring mom and grandmother of a big family. 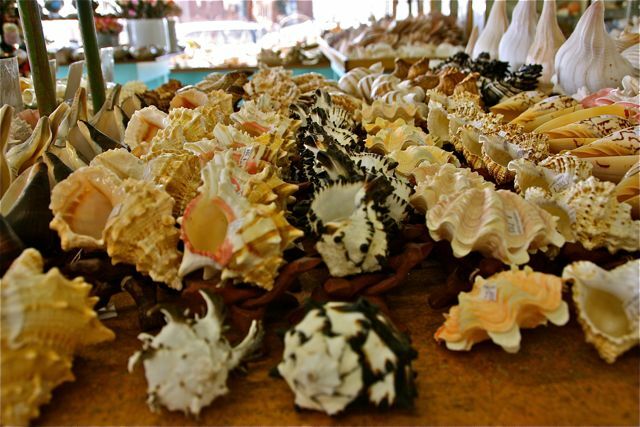 At Morro Bay we visited a fabulous shell shop that had the biggest collection of shells that I had ever seen. 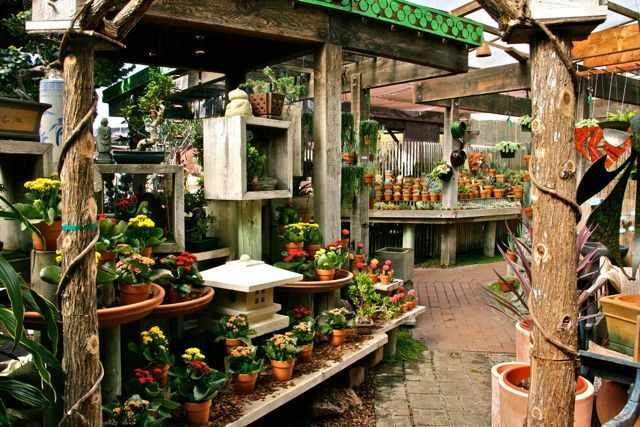 Lois also showed me around a beautiful garden shop that was big, diverse and specialised in succulents. That evening our hosts took us to a theatre restaurant at Oceano to see 'The Great American Melodrama and Vaudeville." It was a highly entertaining evening and a big day. Sorry I tricked you. 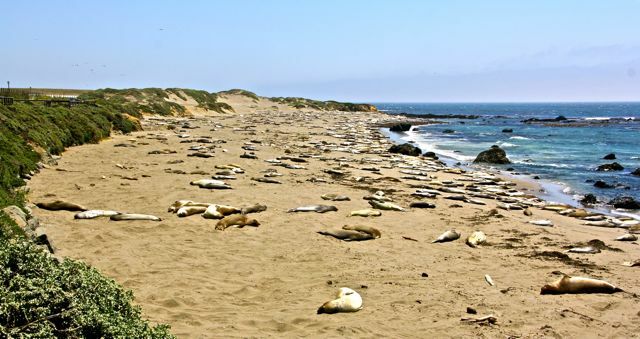 When we were in San Luis Obispo my cousins took us to Piedras Blancas where there is an elephant seal rookery. These tan and brown, females and juveniles come here for their catastrophic moult. 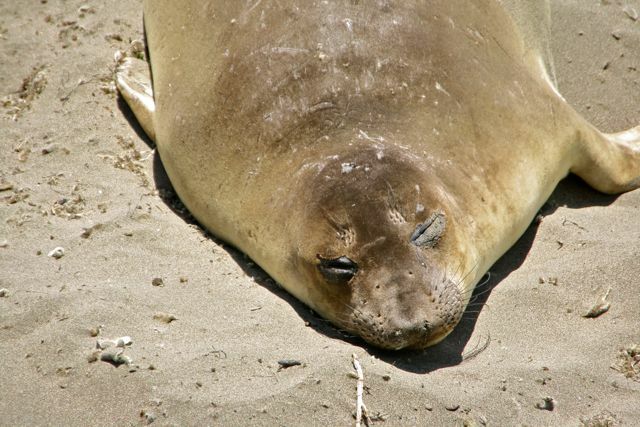 They lose an entire layer of skin and hair as they rest on the beach for 4 to 6 weeks. (What a life!) The males return from feeding in Alaska in November. Only the males have the long nose like an elephant. The seals that are near the end of their moult have silvery new coats. 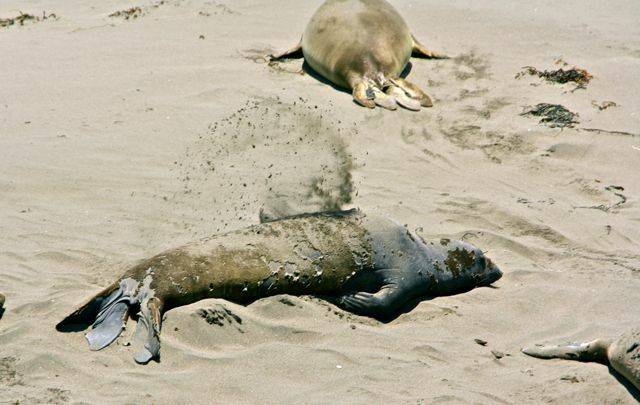 They move by using their flippers to push up and forward and flopping on their belly. It looks awkward and hard work. 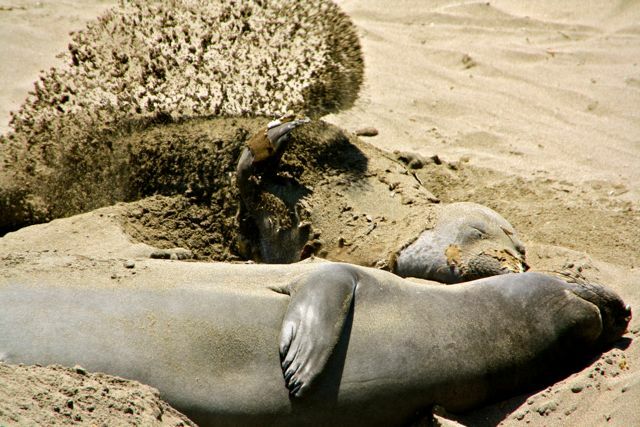 They flip sand over themselves to keep cool. They are plump and bulked up for their moulting fast. 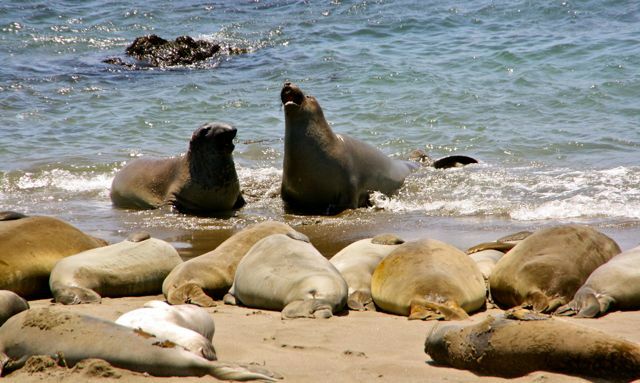 The sub adult males come in June ( these guys must be early) and they are more fun to watch as they like to spar and play, challenging each other with their changing voices, banging their chests together and nipping each other's neck in mock fights. It was very windy and cold on the beach and difficult to get good photos. 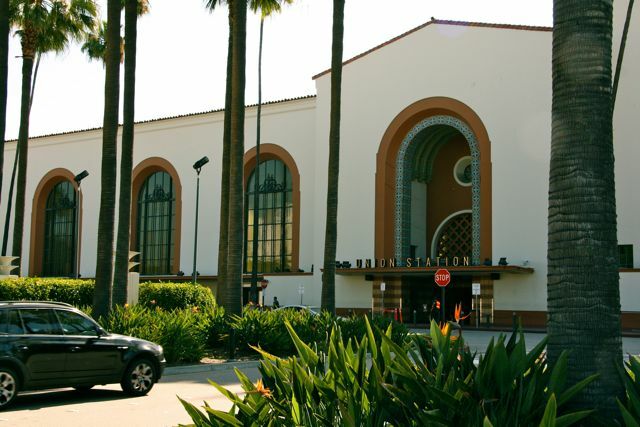 San Luis Obispo is a small city located halfway between LA and San Francisco. The name is Spanish for St Luis the Bishop. It is one of California's oldest communities and it is the home of the California Polytechnic State University. We arrived there in the evening and my cousins, Chuck and Lois, met us at the station and immediately took us on a tour of the town. It is a lovely country, university town. We were taken to dinner at the famous Madonna Inn. 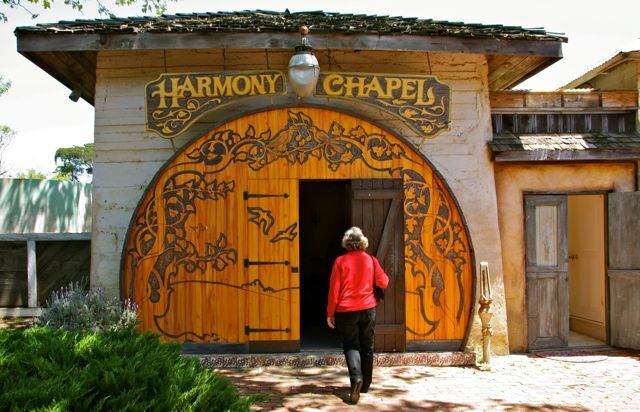 It has 110 rooms all themed differently and a waterfall in the mens restroom. For some great shots of this quirky Inn visit Pat's blog here and Bill's Blog for the men's bathroom. Chuck and Lois have a lovely home and they are the best hosts. The next day they took us sightseeing to many different places. Firstly, Chuck took us for a morning walk through the local park, which was very pretty. 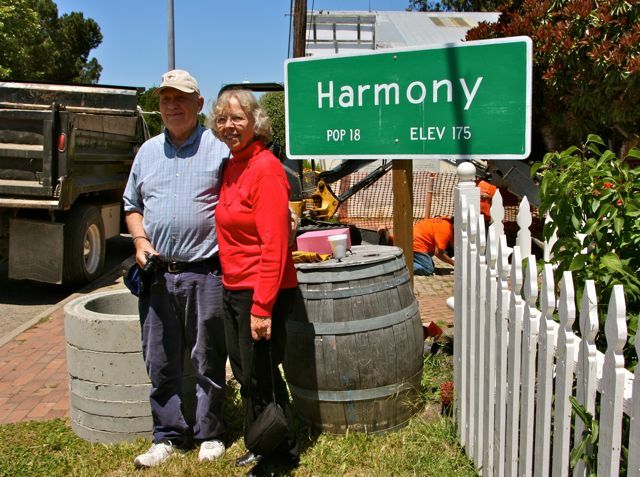 Then we drove to this cute little town called Harmony with a population of 18. It is an artsy town with potters, glass blowers and other artists. As you can see there were some renovations going on too. 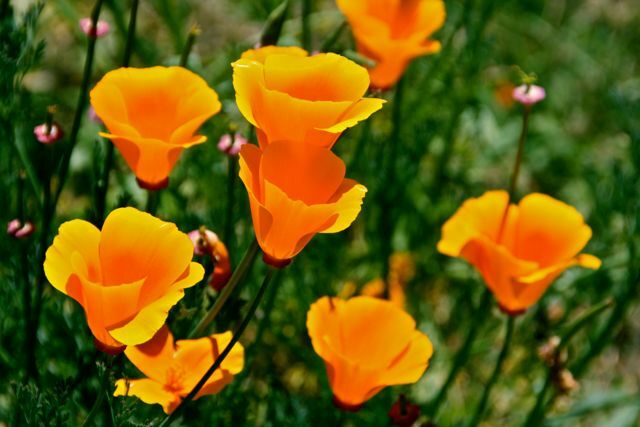 There were pretty gardens and I loved these Californian poppies. This poppy is the state flower emblem. 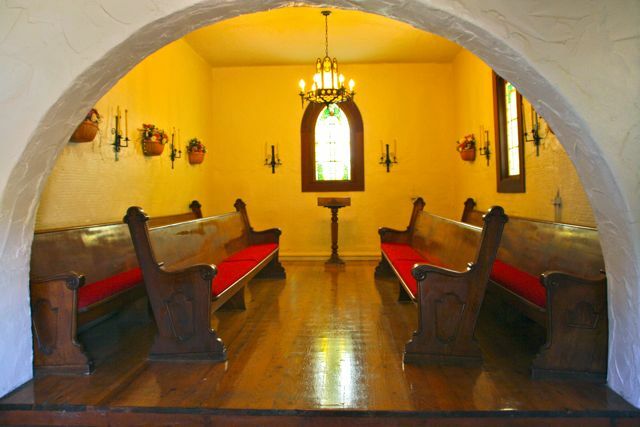 There was the cutest chapel. Big enough for the whole population of the town. 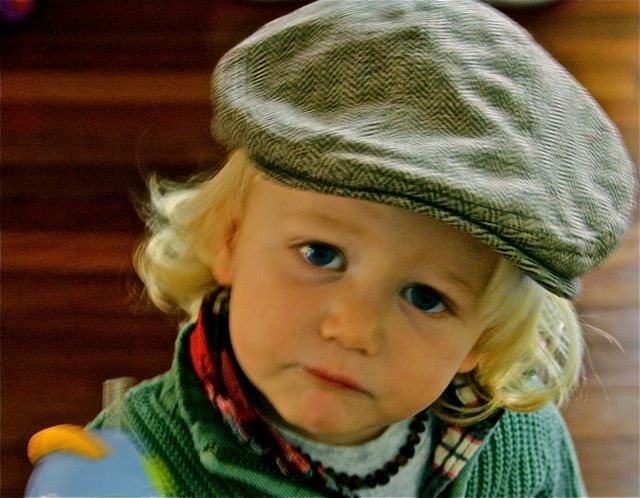 After our grandparent duties in LA, we had booked a tour of San Francisco, Sonoma and the Napa Valley. 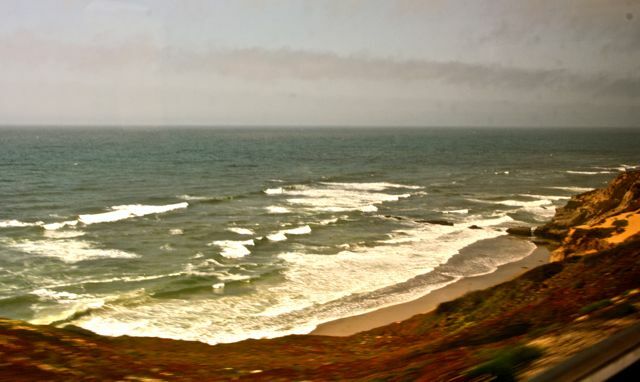 Anyone following my blog will know how we love train trips, so naturally we decided to take the train from LA to SF and stop in SLO (San Luis Obispo) on the way to visit my cousins. 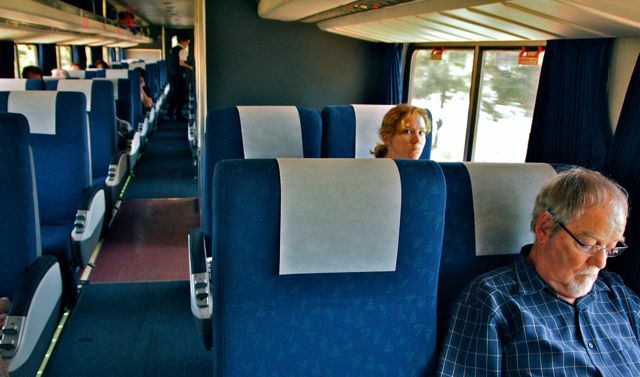 We sadly said goodbye to our family and headed for another adventure before dementia. 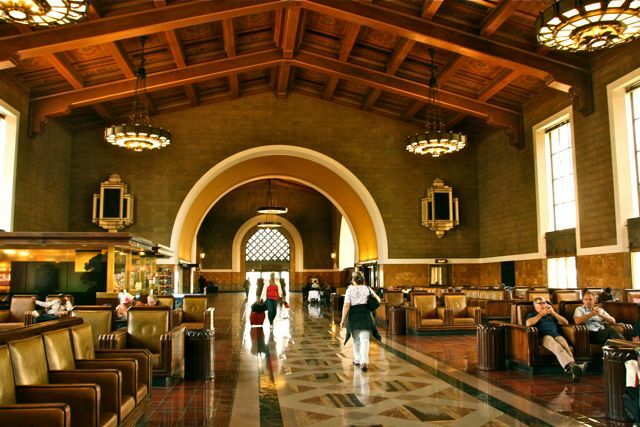 The Amtrak train leaves from Union Station in LA. It is a beautiful building. Looking towards the ticket office and trains. 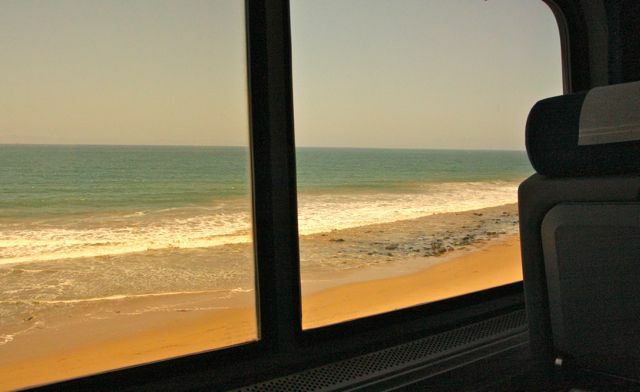 California is a beautiful state. 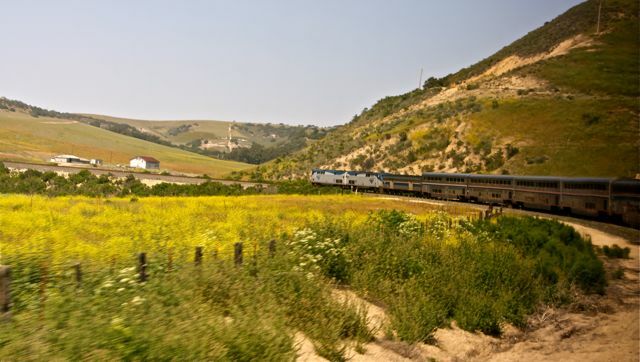 Our train snakes itself towards SLO (San Luis Obispo). It should have taken 5 hours but we were delayed en route and we arrived an hour late.